Artificial Intelligence in Healthcare is receiving more attention every day from the technology and medical communities. 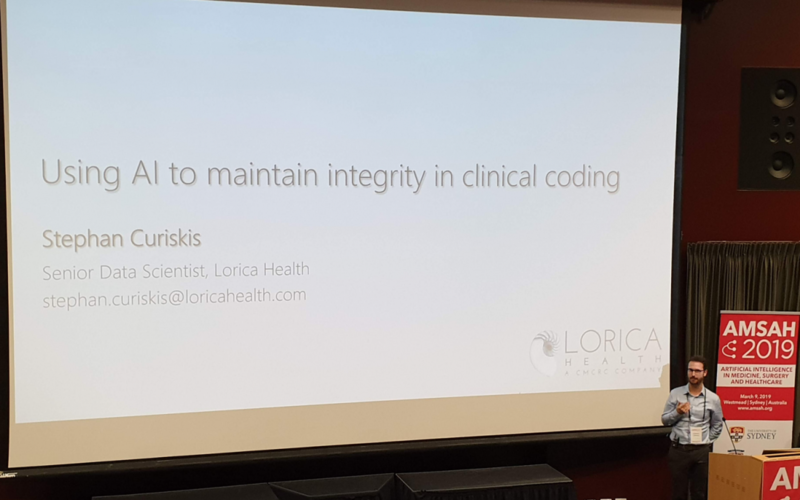 Lorica Health was recently invited to present on how AI can be used to find Fraud, Abuse, Waste and Errors (FAWE) in clinical coding data at the Artificial Intelligence in Medicine Surgery and Healthcare (AMSAH) conference, hosted at Westmead Hospital in Sydney. This conference was a great mix of clinical, academic and industry talks about the cutting edge of technology and medicine. Lorica’s Senior Data Scientist, Stephan Curiskis, presented an overview of how Lorica uses AI to maintain integrity in clinical coding from hospital admission data. Clinical coding is a health administration function that involves the translation of clinical statements from doctors into procedure and diagnosis codes, such as the ICD-10 international medical classifications list and the Medicare Benefits Schedule (MBS). One use of the resulting codes is for billing. During hospital admissions, procedure codes are typically claimed by doctors, while hospitals may claim a range of codes related to accommodation, operating theatre charges, prostheses, and so on. There are many guidelines and requirements for clinical codes to be included in a hospital admission’s data, and clinical coders require extensive training and experience to accurately translate clinical notes to codes. However, the range of possible code combinations is large and complex, which presents opportunities for Fraud, Abuse, Waste and Errors to occur. Health insurers have systems in place to ensure invoiced claims are valid, but often the whole set of codes in the episode of patient care is not analysed collectively. Model the common pattern of data, e.g. using deep learning techniques such as embedding models and autoencoders. Identify outliers and explain what makes them different. Methods for interpretable machine learning are useful here. Generalise the outlier characteristics to inappropriate behaviours results in FAWE, which can be accomplished with a range of unsupervised machine learning. Review with medical experts. Lorica has access to a number of medical domain experts to validate findings. Through this methodology, Lorica continues to target integrity in hospital admission data and improve the efficiency of the healthcare market. The team at Lorica looks forward to the next AMSAH conference, along with further collaboration across the AI and healthcare disciplines.